Khumaga in the Makgadikgadi Pans National Park is probably my most favorite place in Botswana, it is also close enough to us to be able to go for a weekend. But I recommend at least 3 nights. I have lost count of how many times we have been there, but it must be 6 or more. Last visit July 2016. Next visit hopefully soon. The easiest way of getting to Khumaga is through the village of Khumaga, which is just off the Rakops – Maun road. This does include an interesting ferry trip across the Boteti River. There is no fuel at Khumaga so you need to fill-up at Rakops or Maun. You can also enter the Makgadikgadi National Park through the northern gate which is on the Nata – Maun road (143 km from Nata). Then travel down a not so great road to Khumaga. I would only recommend this route if traveling to or from Nata or Nxai Pans. Closest fuel is at Gweta. SKL Campsite: There are a number of big shady campsites available near the Khumaga (western) gate. There are two big ablution blocks which are very clean and well kept. Each campsite has its own tap, fire pit and braai. There is no electricity. There is also a lodge inside the park. which I haven’t visited, so hence I can’t comment on it. The zebra and wildebeest migrate to the pans during the wet season (December – April), so during those months you will see very few. When we went in August this year the elephants had migrated. The best two months we have visited have been April and November. This is not a cheap camping option compared with most of Botswana and the ferry is also not cheap (BWP 180 – each way with a trailer, I think its BWP 150 without a trailer). But it is worth it. A 4×4 is essential, you are not allowed onto the ferry if you don’t have one. The best game drive route is along the river, there are a number of roads down to the river, it is worthwhile taking them. Hi Pete & Sue ,thanks for sharing ,looks like a great place ,came past there on Friday last week on my way back from my camp in Mababe .I would love to see your neck ” o” the woods one day . Which is your camp? Website? a beautiful piece of work on Khumaga…I wish I could blog like you do. You and wife more than welcome to stay at Tiaan’s Camp next time…just notify Heike at info@tiaanscamp.com of your intentions and I will arrange so we can meet. I did a gamedrive to Nxai Pan last week and it was magic….I have not seen so many giraffes in one drive before…and I have been guiding for 24 years. My self drive clients came back equally excited….Nxai Pans are swarming with game. We plan to stay one night when we travel from Maun to CKGR. We plan to leave MAun eraly to spend the afternoon in Makgadikgadi Pans NP. Do you suggest to stay in the NP or outisde (we planned Tiaans Camp). If its just 1 night maybe Tiaan’s is best. I haven’t stayed there, but friends that have say its great. Any longer I would suggest staying in the park, so you don’t have to keep taking the ferry. In October we stayed at Tiaan’s camp and it was great. 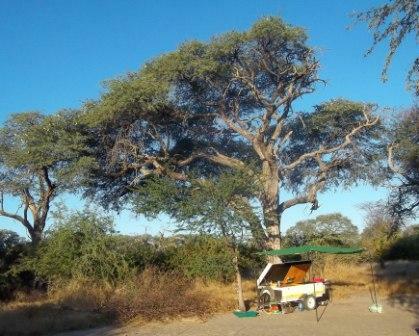 It was one of the nicest camp we saw in Botswana and the pool was great in the heat. But we didn’t go to Makgadikgadi NP. Hope to visit this NP another time. Hi Pete, I have just started to research another trip into Bots! We have done quite a few over the last few years. Camping in Moreme / Savuti / Chobe (2011), CKGR Piper & Deception (2013), Khutse (2014), Mabusehube (2015) and was thinking of exploring the Magadigadi area. I am encouraged by what I have read so far but obviously need to get the timing right. What is the best time to go alternatively where is it best to be in December? I don’t think we have been to Khumaga in Dec, but I am sure it will still be lovely. You can also travel up to Nxai Pan from there and see Bain’s Baobab. At Planet Baobab, they do a trip to see meerkats, which jump all over you, a bit pricey. The pans themselves are very dependant on the rain, last December there was very little rain and we got through to Kubu Island easily.A place you can also visit is Moriti, from there you can visit Kukonje Island and Kaitshe. They also offer motorbike trips across the pans, which is stunning. Camping is also available in Letlhakane ( maybe my camp will be offering some competition by December), so you could do a day trip to Kubu, if you don’t want to camp there. Also if you do camp here a visit to Orapa game Reserve is generally rewarding. Hi Pete This sounds like an amazing place to visit. We live in S.Africa and are planning a trip in May and wondered how we could book at SKL Campsite and would it be possible to get there with a Pajero 4×4 towing a Semi off road caravan. Also how far would we travel on dirt roads and what condition are they. To book email reservations@sklcamps.co.bw – I have been told from reservations that they are full and just gone anyway, once we were the only ones in camp:) The other option in that area is Tiaan’s camp. If you are coming in from the Nata-Maun road you have about 35km of soft corrugated road but easy to make it. The roads in the park are thick soft sand – you may feel more comfortable dropping your tyres. I was looking at your site and I see you recommend a campsite near Moremi called Dijara. It looks like a place we would love to visit, but do you think I would be able to get there with the caravan? Dijara is wonderful. Just a note that ownership has just changed, so who knows what might happen. You will make it there,but a semi offroad caravan might take some punishment. The road from Maun to the vet fence is very rough and badly corrugated. but the rest is fine. Morning Graham – is this your first trip to Bots? Hi, I contacted you earlier this year and you were most helpful. One other question, we are camping at Khumaga, no fuel at Gweta. Wondered what the situation for fuel at Rakops or Mopipi as we are going into CKGR as well. Yes there is no fuel in Gweta, closest is Nata. Rakops does have fuel, but not 100% reliable. Mopipi is more reliable. Thank you for the info and articles,i cant wait to go again! The only problem i have with bots is the very difficult process of booking. What do you recommend? Maybe tiaanś camp is an easier option? I am sorry, but I do not do bookings, or have any tourism destination. Hi there. We are visiting next month. Is there wifi in the camp? I am considering booking at Khumaga campsite. Is it correct that bookings are done through namibweb.com? It seems odd for a Botswana campsite. Thanks Pete. I am finding that campsites that I want to make reservations for are asking me to send them credit card information over the email, which seems like an unwise thing to do. Do you have any experience with a frequently use app in Botswana that would make payments from the US more secure? It is always a risk using your credit card – but as long as you are paying a good company like SKL it shouldn’t be a problem. I do bank transfers for payments. Hi Pete, We (4 Dutchman) have made a reservation at Khumaga campsite :in july 2 out july 5. I have some questions: We come from Maun. What is the best route to Khumaga campsite (is ferry working in july?). Which activities you would propose? Is a visit to Deception valley possible? Where is the best place for game viewing? Hi Rapm – sorry for my slow response but I have been away. The best route is to take the Motopi turn – could also be called Rakops. Head to the town of Khumaga and catch the ferry there. 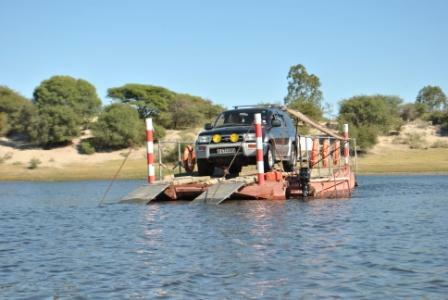 The ferry runs all year round when there is water in the Boteti – else you drive across if there is no water. 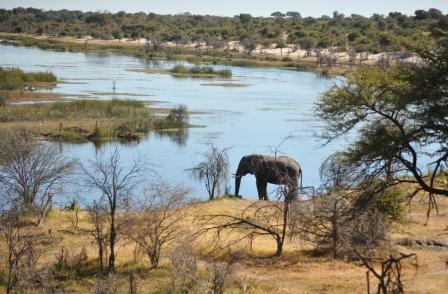 The best thing to do is self drive keeping next to the river for best game viewing. Deception valley is a bit far – best to get there and camp a few nights there.